Get comfortable, take a deep breath, close your eyes, notice your surroundings, notice your body, and relax. Notice the base of your spine and send a hello to the center of the planet. Connect the two with a line of energy, creating a grounding cord. Create a grounding cord and connect. How does your body feel to connect and release energy? Once you are grounded, take a deep breath, and notice where your attention is. Is it on your body, your spouse, on your job, on your kids? As you get an idea of where your attention is, get the idea of bringing it back to yourself, back to your body. As an experiment, become aware of your right hand. Put your attention in the palm of your hand. Notice what it feels like to have your attention in the palm of your hand. Next, notice your left foot, be in your left foot. Notice your nose -let yourself be at the tip of your nose. Then notice your eyes- move back until your attention is right behind your eyes- how does it feel to be in the center of your head? Notice what you find there- is it noisy? Are there thoughts there, or other people? Notice what is there, then notice that you are not any of these things, – you are the awareness in the center of your head. Now, take a deep breathe, and release whatever it is you’ve found in the center of your head. Release it down your grounding cord, just let go of those thoughts, images and sensations. What happens when you let go? Notice how much room there is in the center of your head- as you let go, does that give you more room? Now decide how you can create the center of your head as a sanctuary for yourself. You can create a beautiful room, or a landscape, a color, a feeling of warmth. Create it just for yourself. Is it big enough? Notice what happens to your body when you settle into the center of your head. Acknowledge your body, and yourself in the center of your head. Next, create a golden sun, and let it flow through the center of your head. Make another sun, and let it flow through and fill up the rest of your body. When you are all full, open your eyes, stretch, and enjoy the new perspective from the center of your head. 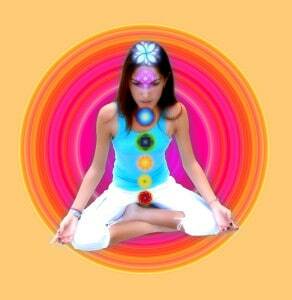 Download the MP3 instructional package, for Meditation Class Three. It is enhanced with sound therapy techniques to deepen your meditation experience.